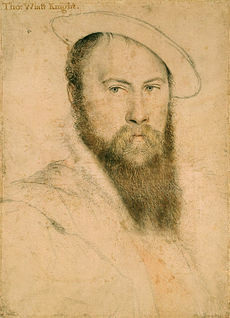 Thomas Wyatt was born in 1503 at Allington Castle near Maidstone to Henry Wyatt and his wife, Anne Skinner. Henry was one of King Henry VII’s Privy Councillors, a position that continued upon the ascension of King Henry VIII. 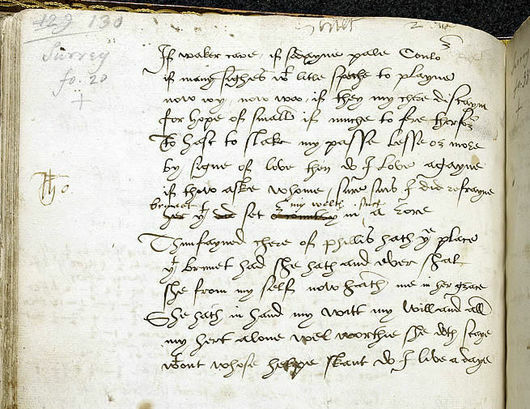 Wyatt would first enter the court of King Henry VIII in 1515 as a ‘sewer extraordinary’ (another name for a waiter). In the same year he entered St. John’s College, Cambridge. Three years later in 1520, aged 17; Wyatt married Elizabeth Brooke, daughter of Thomas Brooke, 8th Baron Cobham. The couple would go on to have a son the following year; also called Thomas (he would go on to lead Wyatt’s Rebellion years later). The marriage between Wyatt and Elizabeth fell apart in approximately 1525 when Wyatt separated from his wife and charged her with adultery. At some point as their marriage was failing Wyatt had allegedly fallen for Anne Boleyn, although they most likely had met the extent of their relationship is unknown. Wyatt began undertaking more roles within the court and accompanied Sir John Russell, 1st Earl of Bedford, to Rome to petition Pope Clement VII to annul the King’s marriage to Katherine of Aragon and allow him to marry again. He was also appointed as High Marshal of Calais between 1528 and 1530 and Commissioner of the Peace of Essex in 1532. When King Henry VIII and Anne Boleyn travelled to Calais in order to present Anne to the French King, Wyatt was part of the retinue that travelled with them he would later serve in Anne Boleyn’s coronation in June 1533. Of truth, circa Renga tonat. By proof, I say, there did I learn. Wyatt was released soon after Anne Boleyn’s death and returned to favour within Henry’s court, he was made ambassador to the court of the Holy Roman Emperor, Charles V, in Spain returning to England in June 1539 before departing again in May 1540 to resume his role as ambassador. Although Wyatt was technically still married in 1537 he took Elizabeth Darrell as his mistress and they had three sons together and in 1540 he was granted the site and manorial estates of the dissolved Boxley Abbey. In 1541 Wyatt was charged with treason after an original charge from 1538 was revived against him by Edmund Bonner, Bishop of London. Bonner had claimed that Wyatt had been rude about the King and also had contact with Cardinal Pole, the King’s relative and papal legate who Henry was most displeased with after he sided with Rome over his divorce to Katherine of Aragon. Wyatt was again placed inside the Tower of London but was pardoned once again, possibly by the request of the current queen, Catherine Howard. Wyatt was again released and given royal offices following his pardon from the King. However, shortly after welcoming Charles V’s envoy at Falmouth he was taken ill and died on 11th October 1542 whilst staying with Sir John Horsey at Clifton Maybank House, Dorset. He is buried in Sherborne Abbey. 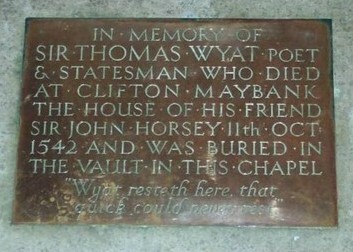 Wyatt’s poetry was published 15 years after his death and along with Henry Howard, Earl of Surrey, was one of the first to introduce the sonnet into England. On this day in 1555 – Death of Sir John Russell. Sir John Russell was born in 1485 in Dorset to James Russell and his first wife Alice Wise. Sir John had a very successful career at court and held many high ranking offices. He first came to the attention of the Tudor court in 1506 when Archduke Philip of Austria and Juana, the King and Queen of Castile. Juana was also the sister of the dowager Princess of Wales, Katherine of Aragon. The Spanish monarchs had been shipwrecked off the coast of Weymouth on a diplomatic trip to visit King Henry VII. As a result of their detour, Russell escorted them to London to complete their journey. Philip and Juana highly praised Russell and the service that he provided to them to King Henry VII, who in 1507 made Russell a Gentleman of the Privy Chamber. A position he held after King Henry VIII ascended the throne. Russell went on to loyally serve Henry VIII’s court. Russell was involved in the War of the League of Cambrai (also known as the War of the Holy League) and he was present at the taking of Tournai and Thérouanne. Russell was knighted by Henry VIII in 1522 after losing an eye in battle in Brittany. Sir John Russell help a wide range of posts in the Tudor court from serving as High Sheriff of Dorset and Somerset in 1528 and acting as a Member of Parliament for Buckinghamshire between 1529 and 1536. After the downfall of Anne Boleyn and her family in 1536. Russell was made a Privy councillor and helped suppress the rebellion of the Pilgrimage of Grace in autumn 1536. Russell also benefitted greatly from the downfall of another courtier, Henry Courtenay, 1st Marquess of Exeter. After Courtenay’s execution Russell was made a Baron and Lord President of the Council in the West. This was quickly followed by being invested in to the Knight of the Garter. Finally in 1539 Russell was made High Steward of Cornwall and Lord Warden of the Stannaries. During Henry VIII’s Dissolution of the Monasteries Russell was granted many lands, these included Tavistock Abbey and Plympton Abbey in Devon, making him the largest land owner in Devon. Russell was also granted Blackfriars in Exeter where he later built Bedford House. Russell was also granted lands in London, including the kitchen garden of Westminster Palace. In the modern day this is now the site of the busy Covent Garden. In 1540 Russell was made Lord High Admiral. At this point he had a very close relationship with Henry VIII. The day after Henry met Anne of Cleves for the first time Henry asked Russell whether he thought Anne to be fair. Russell replied that he found her “not to be fair, but of a brown complexion”. An answer which probably saved Russell when Henry was trying to find ways out of his marriage. In 1542 Russell resigned from his position as Lord High Admiral and was elevated to the role of Lord Privy Seal. One of the highest positions within the council. Russell remained close to Henry VIII throughout the King’s final years. He was entrusted as one of the executors of Henry’s will and was appointed one of the 16 councillors that help rule the country during the new King, Edward VI’s, minority. Russell also acted as Lord High Steward at the coronation of the young King, who in return elevated him to the title of Earl of Bedford in 1550 and in 1552 Lord Lieutenant of Devon. In the final days of the young King on 16th June 1553 Russell was one of the 26 peers who signed a settlement of the crown on Lady Jane Grey, ensuring that she would be Edward’s heir and not his sister Mary as was expected due to Henry VIII’s final Act of Succession. Sir John Russell died on 14th March 1555 and was buried in the Bedford Chapel in the church that lies next to Chenies Manor House, his ancestral home. 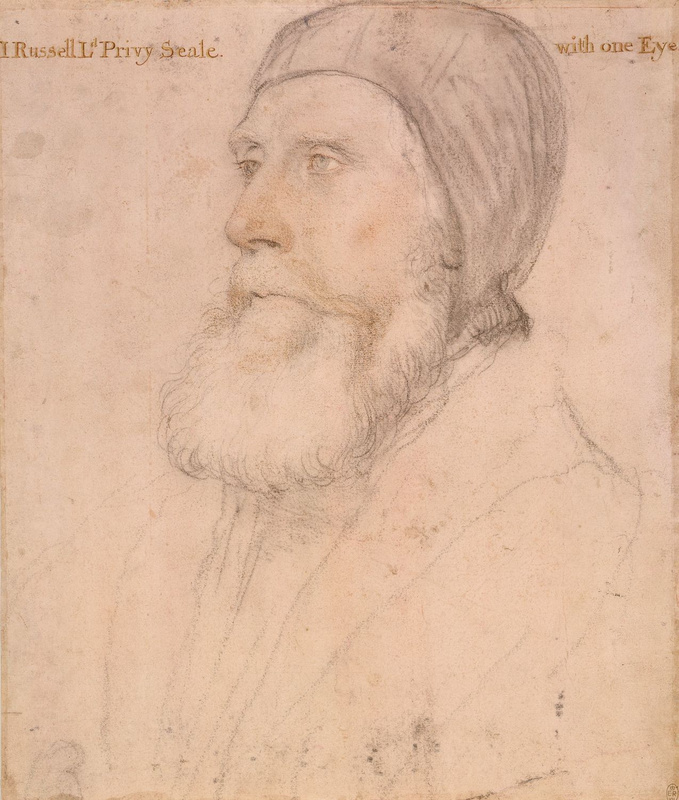 Sir John Russell painted by Hans Holbein the younger.